The Department of Veterans Affairs will pay for service dogs assigned to veterans with impaired vision, hearing or mobility, but it will not cover the cost of dogs assigned for mental disabilities like post-traumatic stress disorder, according to new federal regulations. Many dogs provide support to veterans suffering from PTSD, but although more veterans are being diagnosed with the anxiety disorder, the VA says there's not enough evidence that these dogs help with the symptoms of combat-related disabilities. A new Army policy has already made it more difficult for soldiers to obtain service dogs and keep them on Army bases. There’s plenty of anecdotal evidence that service dogs help veterans cope with PTSD, but research lags and the VA is skeptical. "VA has not yet been able to determine that these dogs provide a medical benefit to veterans with mental illness. Until such a determination can be made, VA cannot justify providing benefits for mental health service dogs," the department said. Researchers at the James A. Haley Veterans Hospital in Tampa, Fla., are conducting the first study to look at benefits of pairing veterans with PTSD with specially trained dogs. Congress recommended the three-year study, permitting the Department of Veterans Affairs to match as many as 200 veterans with dogs, but only 17 participants are currently enrolled. But unlike service dogs for people with more obvious physical disabilities, there can sometimes be confusion over who can have a dog accompany them into certain places. The American Disabilities Act requires businesses to allow people with disabilities to enter with service animals, but dogs whose sole function is to provide comfort or emotional support do not qualify as service animals under the ADA. However, according to the ADA, dogs that calm a person with PTSD during an anxiety attack are considered a reasonable modification to ADA policies. 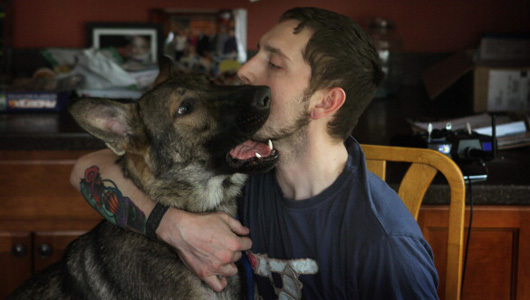 Although PTSD service dogs are trained to respond to certain cues, such as nudging an owner into a petting session if he exhibits panic attack symptoms, and to perform tasks like reminding him to take medications, some people are skeptical of the idea that a dog can assist with a so-called "invisible" disability. For more information on service dogs, visit the International Assistance Dog Week website. Link to Mother Nature Network. Labels: Department of Veterans Affairs, military veterans, post-traumatic stress disorder, PTSD, V.A.